Atlanta’s famous festival culture goes into overdrive during April. Dozens of fests celebrate everything from art and food to music and movies. Check the map at the bottom to find the closest festival to you. Feed your need for speed and race in the Soap Box Derby. Or you can get a little dirty at the Macon mud run. Want to play with something more exotic than a dog? Come visit the farm animals at the Chattahoochee Nature Center. Adults can get their groove on with Lefty Williams Band, Cigar Store Indians, and more, while kids can get their play on with face painting, inflatables, and rock climbing. 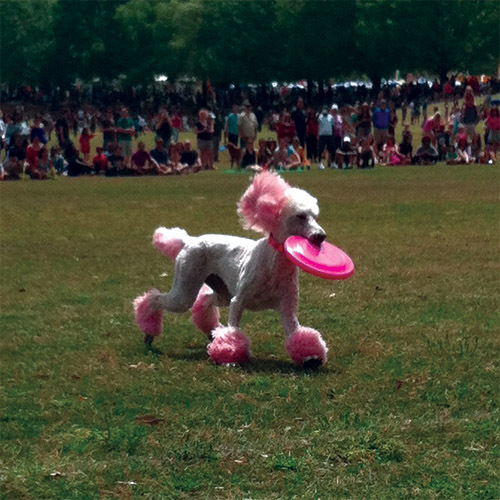 Watch man’s best friend compete during the Disc Dog Tournament. This is serious stuff; some of the furry athletes are international and travel long distances for the chance to take a bite (proverbially) out of the competition. Want to travel the world? Look no further. UGA international students sponsor booths in downtown Athens displaying different cultures. Not to be confused with the Atlanta Dogwood Festival, this event features food, music, arts and crafts. Don’t forget the Hot Air Balloon Rally which starts at 5 p.m.
Eat a 1.5-pound turkey leg and transport yourself back to Medieval times in Fairburn. (We know, the turkey is a New World food and this festival purports to celebrate the European Middle Ages, but don’t let historical details spoil your fun. Nor that the Renaissance wasn’t by definition Medieval . . . ) This festival runs all summer and showcases interactive art and entertainment, featuring more than 150 artists. Visit one of 10 stages for music, comedy, juggling, and more. Watch eight Italian films at the Plaza Theater, including “Zoran, Il Mio Nipote Scemo” and “La Mafia Uccide solo d’Estate.” Each film is only $10 at the Plaza box office. Experience an entire day of sports—including archery, football, gymnastics, and soccer—with the Youth Sports Clinic taught by professional instructors at the Cobb Galleria. Join in the festivities on the riverbank, including live demonstrations, performing arts, musical performances, and a kids zone. Another art festival. This one features more than 100 artists from around the country. Amenities include a kids zone and food. Admission is free at this fest in Olmsted Linear Park, featuring more than 125 displays of fine arts and crafts. Participate in the Tastiest Pound Cake contest by eating and voting for your favorite in McDonough Square. There’s art, too. This family-friendly festival will showcase the Rowdy Rooster Puppet Show. Let’s not forget about the Master of the Chainsaw, who will transform a log into a work of art. This art festival corrals more than 150 artisans within the streets of Sandy Springs. Interactive art stations, food, and music are included. Formerly known as the Taste of East Point, this year the festival has a bigger focus on art and music. Explore work by local artists while listening to live music from Black Lion, Pjazz, Mudcat, and more. Need a good book for a great deal? This festival hosts the book sale of Friends of the Smyrna Library at the Village Green in downtown Smyrna. The annual fundraiser for 89.3 FM WRFG Atlanta will feature Playing On the Planet, Cedar Hill, Curtis Jones & Primal roots, and other bands at the Clarkston Community Center. For anyone tired of listening to Top 40, try this bluegrass festival in Dahlonega. The lineup features 2012 and 2013 Telluride Band Contest winners along with the Skillet Lickers, Threadbare Skivvies, and Ugly Cousin. For a change of pace, this festival focuses on all things Arabian. Enjoy cuisine, music, and art. When you get tired, visit the largest Arabian tent in Atlanta for a cup of Arabic coffee. See the barbecue showdown featuring professionals and backyard cooks in Gainesville, Ga. The winner gets $700 and, more importantly, the Chicken City Cup. Learn how to cook like a pro by watching culinary demonstrations. Once you’re good and hungry, you can buy “tastes” from 75 booths. Barbecue and Beer—two of the best “B” words—will be featured at the Masquerade Music Park. Fill up your stomach while treating your ears to the Geeks Band, DJ QTip, and more. Run in the 5K, drink a beer afterward, and dance at the Not-So-Silent Disco at Centennial Olympic Park. Snoop Dogg, 311, Cage the Elephant, and Primus are among the headliners.